Whether your Fitbit tracker lasts for a day or a week, eventually you'll need to charge it again. Fortunately, charging a Fitbit's battery is a fairly simple process and takes a relatively short time to set up and fully charge. Here's everything you need to know about how to charge a Fitbit, how long it takes, and what equipment you'll need to do it. How Long Does it Take to Charge a Fitbit? According to official Fitbit instruction manuals and faqs, charging the average Fitbit device is said to take up to two hours on average to fully charge. In reality though, it usually takes much less time and some trackers, such as the Fitbit One, can fully charge in under 30 minutes. Regardless of your Fitbit model, it's best to check the charge status on the device's screen while charging to get an idea of how long charging yours will take. Because many Fitbit models have a battery life that can last for several days, you typically don't need to fully charge a tracker before you can use it. If you're in a rush, half a charge should be more than enough to last for the next 24 hours. All Fitbit models require either a charging cable or a charging cradle to charge. All new Fitbits come with their required charging equipment, however, if you purchased a Fitbit second-hand, you may need to ask the seller for it. A charging cable: Fitbit Ace, Fitbit Alta, Fitbit Alta HR, Fitbit Charge, Fitbit Charge 2, Fitbit Charge 3, Fitbit Charge HR, Fitbit Flyer, Fitbit Ionic, and Fitbit Surge. A charging cradle: Fitbit Blaze, Fitbit Flex, Fitbit Flex 2, Fitbit One, Fitbit Zip, and Fitbit Versa. All Fitbit models charge via a USB connection. This can be plugged into a computer's USB slot to charge or, if you have one, a USB power socket. If your Fitbit model only requires a charging cable to charge, the entire process is incredibly simple. Locate the correct charging cable for your Fitbit tracker. Plug the USB end into a USB slot on your computer, charging station, or battery pack. If you need to charge your Fitbit while traveling, you can charge it with a battery pack just as you would a mobile phone as long as you have its charging cable or cradle with you. Connect the other end of the charging cable to your Fitbit, usually on the rear of the device. The slot on the Fitbit Flyer is hidden by a flap on its cover while the charging cable for the Fitbit Ionic connects to the back of the tracker magnetically. Charging will begin automatically and a charging symbol should appear on the Fitbit's display. Several Fitbit models can't simply connect to a cable and need to be placed within a special charging cradle to charge. These models are typically placed within a wristband or clip-on case when worn or used. Remove the Fitbit from its band or case if in one. Plug the USB end of the cable connecting to the charging cradle into a USB port. Place the Fitbit into its charging cradle while making sure to align any gold connecting parts on the device to those in the cradle. The end of the Versa charging cradle will need to be pinched together for it to open before the Fitbit Versa can be placed inside it. The screen on all models should be facing upwards, towards you, when being placed into a charging cradle. Charging should start automatically. The display on the Fitbit should light up and a charging icon will appear if charging has started successfully. 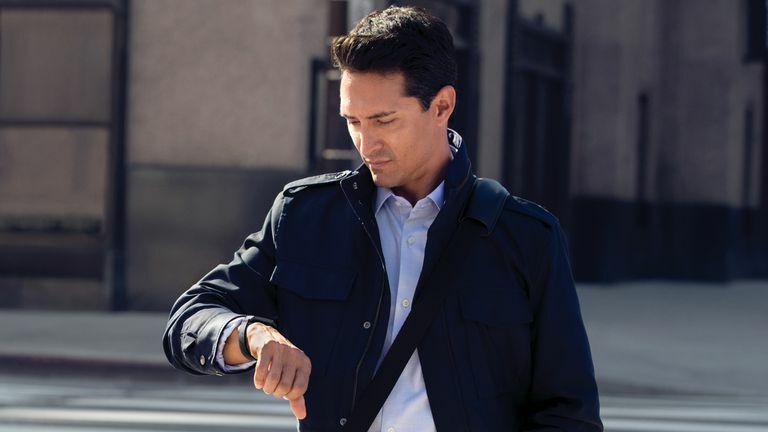 If you've followed the instructions above and your Fitbit still fails to begin charging, here are some things to check. Make sure you're using the correct charging cable or cradle. If you've owned several Fitbit models, you may have picked up the incorrect charging equipment. Check that your computer is turned on. If you've plugged the USB end of the cable into a laptop or computer, make sure that it's powered on as it may not charge the Fitbit if in sleep mode or shut down. Clean the connecting ends of the Fitbit and cable or cradle. Dirt and oils can affect connectivity. Is the Fitbit wet? If you've used the Fitbit while swimming, wait for it to dry before trying to charge it. Make sure the cable or cradle are also dry. Is there power? If you're using a USB port at an airport or café, its power may have been turned off by staff due to a technical issue. You can check that it's active by charging your smartphone or other electronic device.